Due to some weather and a bunch of cancelled flights at a certain airport in Georgia, Rob didn't make it to Arizona as early as we thought he would. Ultimately the put our arrival time into Sedona back quite a bit. Luckily the wonderful AirBnB that served as our home base was within walking distance to a few restaurants so we could go straight to dinner upon arrival. We began our babymoon at the Cowboy Club Grille with some wild rattlesnake cakes, buffalo tenderloin (for Rob) and their famous baby back pork ribs (for me.) After that we ventured over to Mooney's Irish Pub to get Rob a nightcap and to take in some local entertainment (aka karaoke.) That is one thing to note about Sedona, there isn't really much nightlife. Not a huge deal for babymooners, but worth mentioning. The next morning we woke up before sunrise and decided to head out and tackle Cathedral Rock while the sun was coming up. Technically Rob tackled it, I made it up a ways and then found a nice place to relax while Rob went on climbing. 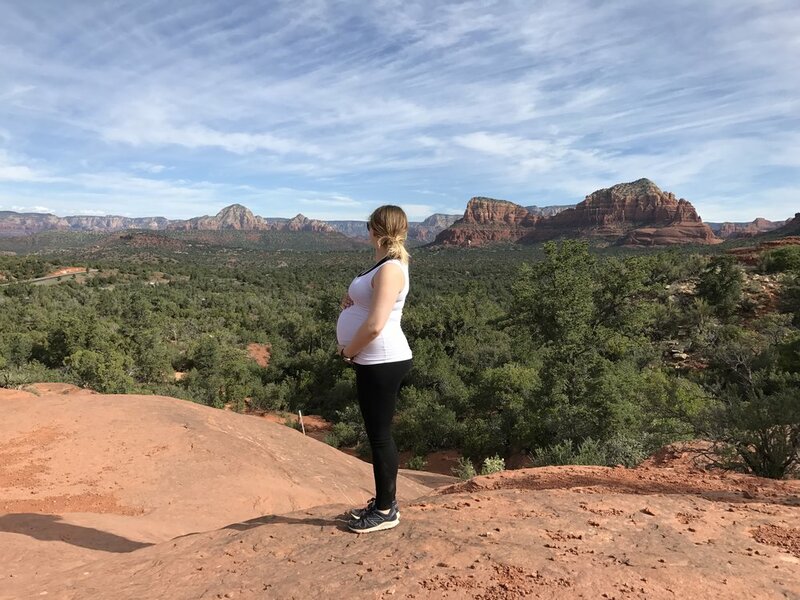 We still had some time to kill before I was due at the spa for some prenatal pampering, so we headed over to the trail that leads to Devil's Bridge. It's a bit of a hike when you don't have a large vehicle to off-road you some of the way there, so we only made it far enough to see the natural rock bridge. Still a worthy hike and by the time we made it back to the car we were starving. Luckily Local Juicery was on the way back to the part of town we were staying in and the spa. The chocolately, banana, collagen protein filled smoothie I had really hit the spot. Our first stop was Paige Springs Cellars. We snagged some seats on their back patio and Rob was walked through a somewhat custom flight of some of their red wines. I was actually pretty impressed with this. After asking about our wine preferences (we'd never tasted Arizona wines before and our current favorites tend to be California reds) the woman helping us offered to switch out some of the reds on their tasting menu for others she thought Rob would enjoy more. After the tasting, Rob ordered a full glass and we meandered around the beautiful property for a bit. Next we stopped by Oak Creek Vineyards before heading back towards Sedona. We weren't quite ready to head to dinner yet so we stopped by Stillpoint Aromatics to pick up a few of their essential oil signature blends. I went for the Sedona Spirit and Summer Solstice. Lulu's Chocolate Lounge also happened to be close by. I simply wanted to sample some the locally made, organic chocolates but found myself tempted by their tonic menu. Rob sipped on an espresso while I enjoyed a tall, cold glass of beauty food. The mix included coconut milk, coconut cream, rose Tulsi tea, honey & schizandra. I also bought a lot of chocolate. I was about to say too much, but there's no such thing as too much chocolate. I'll be ordering more of the love truffles ASAP. Our final stop of the afternoon was Oak Creek Brewing and Rob seemed pleased with their beers. We did a good job taking turns choosing things to do. 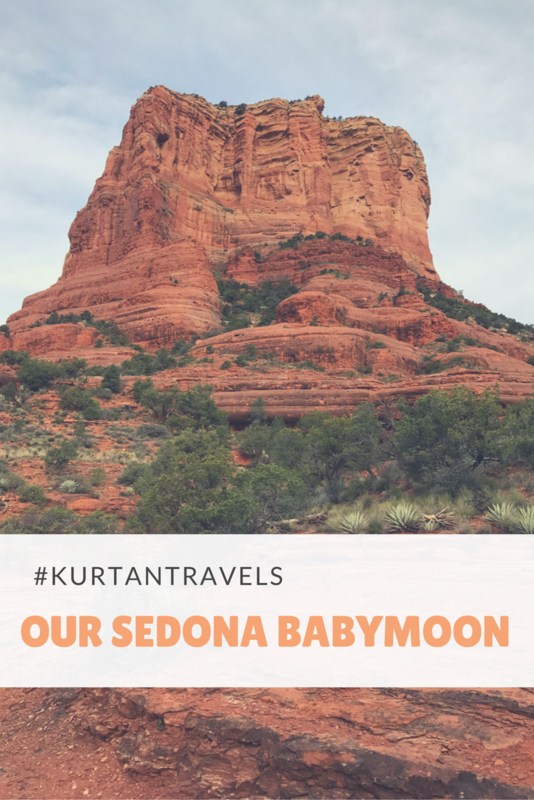 The babymoon is about both of you ;-). For dinner, we decided we needed to see what all the hype surrounding Elote Cafe was about. 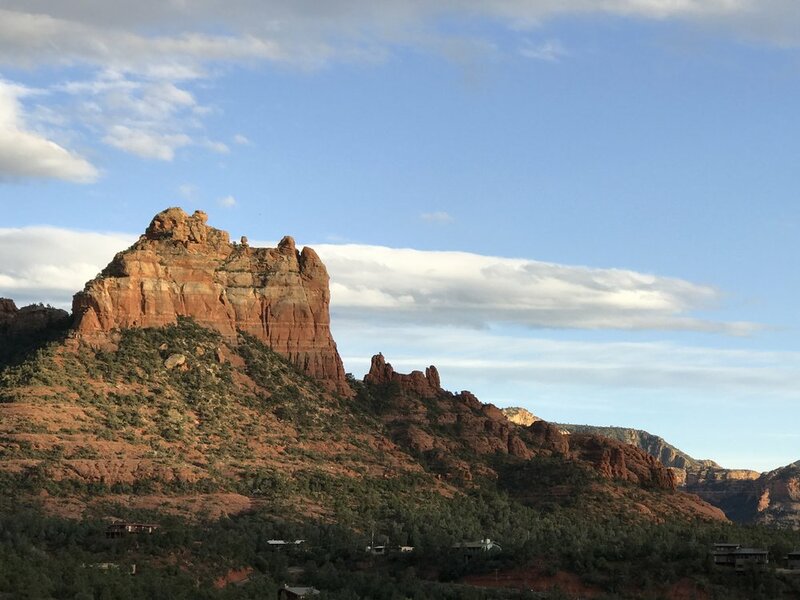 The most popular restaurant in Sedona doesn't take reservations, so part of the experience is the wait. Grab drinks and some popcorn to munch on at their side bar and snag seats on the outdoor patio. My dark restaurant photos will do no justice to the food here, so I'll just say that you must eat here if you're in Sedona. 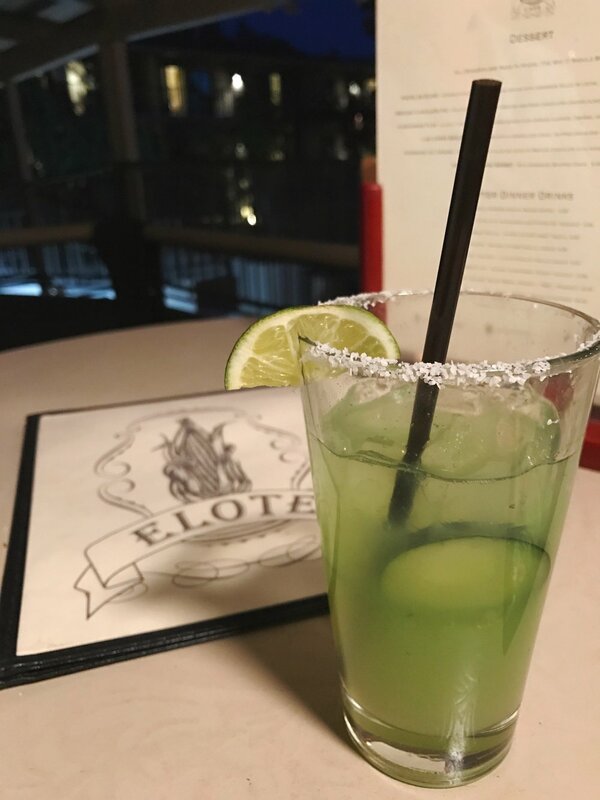 Take your server up on their suggestion of the signature Elote appetizer and then follow your taste buds from there. We loved the salsa and guacamole, Rob had smoked pork cheeks and I devoured the scallops. We enjoyed everything so much we bought a cookbook to take home. The chef, Jeff Smedstad even came out to sign it for us. Content and ready to succumb to our food coma, we headed back to our AirBnB. We planned on getting up again early for another hike. We decided on the Courthouse Butte loop, an easy to moderate 4.5 mile loop around Bell Rock and Courthouse Butte. We really enjoyed this hike. It allowed Rob some opportunities to do a little extra climbing and wasn't too strenuous for the pregnant lady. You'll see a wide range of plant life and there's no bad view. Not a bad way to start your day. After we completed the loop we ventured a bit up Bell Rock. Again Rob went a lot farther than I did, but I was more than happy to sit and soak up some that vortex energy. It also gave me a few minutes to research a place for breakfast. Google did not disappoint. Red Rock Cafe was the perfect morning indulgence after a few hours of hiking. Once we refueled we stopped to get a closer view of the Chapel of the Holy Cross, the beautiful house of worship built right into a cliff. No matter your religion, it's worth a closer look. Trying to maximize our time we next drove up to the Airport Vortex area. We didn't end up hiking to the actual vortex but enjoyed the vista for a few minutes before heading back to our AirBnB to get ourselves cleaned up. We try to bring home some sort of art from everywhere we travel so we decided to walk around the Tlaquepaque Arts & Crafts Village for a bit and see what we could find. No traditional wall art stood out to us, but Rob did indulge me with a gorgeous piece of turquoise and gold jewelry. When we needed a little break we popped into the Oak Creek Brewery and Grill so Rob could check out their brews and to snack on some fried pickles. After that we stopped by Sedona Healing Arts and picked up a beautiful dream catcher for Baby K's nursery. Ready for some more grub we parked the car at home and wandered down to the Sedona Pizza Company. While enjoying our lunch and a few minutes of Master's viewing we decided we were going to bring some crystals home with us to help decorate our updated living room. 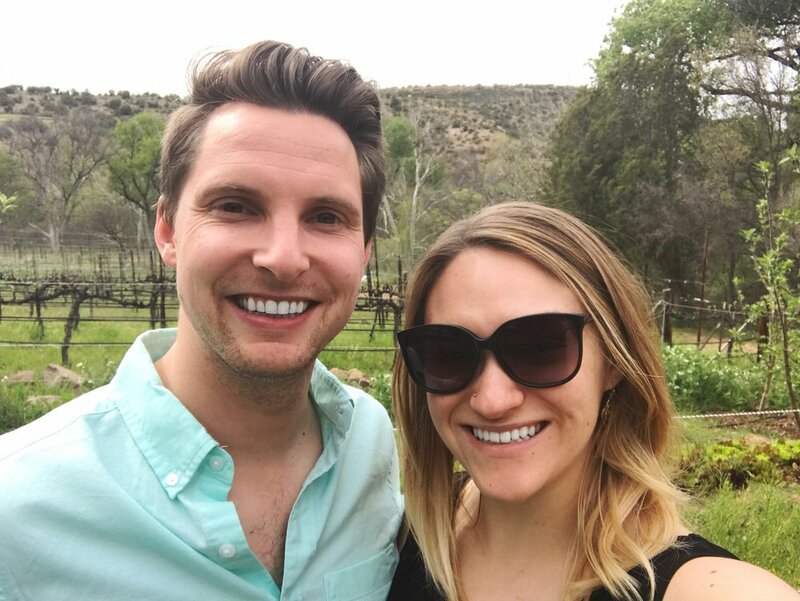 There are no shortage of crystal shops in Sedona and we had no trouble finding pieces of green opal and black tourmaline that we both felt belonged in our home. After dropping off our somewhat heavy purchases back at the AirBnB we walked around uptown a bit more. I satisfied a sweet craving at Black Cow Cafe and while I enjoyed my cone, Rob pointed out a particularly cute rock formation known as Snoopy's Belly because it looks like the iconic image of Snoopy laying on top of his house. Next we ended up hanging out at Open Range Grill & Tavern for a bit so Rob could catch a Penguins game. As sunset approached though we decided to head to our dinner destination, Mariposa Latin Inspired Grill, a little early to enjoy our last sunset over the red rocks. We enjoyed another delicious dinner. The atmosphere was romantic and the food excellently prepared. We shared some empanadas to start, I went with a petite fillet and Rob ordered the evening's special, some sort of mixed grill that had sausage, steak, a lamb chop, artichoke hearts, some beans and a few other things. Not quite ready for dinner and ultimately our trip to end we stayed through dessert. When it was finally time to head back and settle in for the night we chatted about how much we enjoyed ourselves and what we looked forward to doing the next time our travels brought us through Sedona. In the morning we packed up and headed for Phoenix after a quick stop for provisions at Wildflower Bread Company. There was lots of glancing out the rear view and side mirrors as we tried to keep Sedona's peaks in view as long as possible.